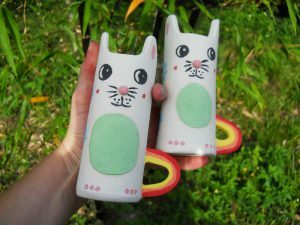 These are the prototypes of the new bunny rainbow pottery vases. Each one with a cute rainbow tail. The backside has lots of stamped flowers painted in bright colors. These are in the greenware form, just raw clay that has dried after forming into shape. I painted them in underglase paints. They were made from a lump of clay that I rolled with a rolling pin. New pottery pieces coming in another week or two. Including this fancy beaver planter. This is a photo of the unfinished beaver in its green-ware state. It has been painted with underglaze. and has many flowers on its back side. A few pieces are being bisque fired today and will be ready for glaze tomorrow. I hope you enjoy my new “Fancy” line as much as I do. I’ll post updates as soon as they are ready. 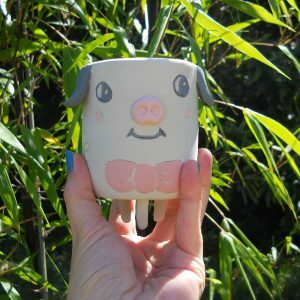 Hi all, I have started a new blog to showcase my new line of ceramics. 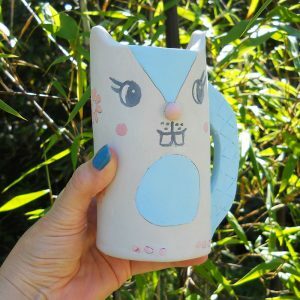 I will be making one of a kind pottery pieces to bring the cute into your homes. Please favorite and check back soon.